Adults, adolescents and children are seen in a variety of treatment settings, including individual, couple and family therapy. Treatment modalities incorporate Cognitive Behavioral Therapy, Adlerian principles and Clinical Hypnosis to improve coping and bring about positive resolution. Check this web site for more information. Benches that are Green regardless of the Color. Reducing waste by using recycled plastic brings another benefit far more durable than wood. It's immune to most of the common issues that limit the lifespan of wood or metal furniture. It also sheds dirt and needs no refinishing a very long lifespan. You can feel good about purchasing our benches your customers and visitors feel good sitting on them! 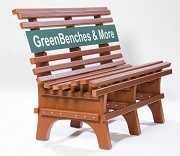 You company name can be permanently inscribed on each bench. Available in all different sizes. Check this web site for more information and pictures.